In our previous blogs around Magento we talked about why Magento has always been a first choice among retailers and how they can leverage upon Magento enterprise feature. 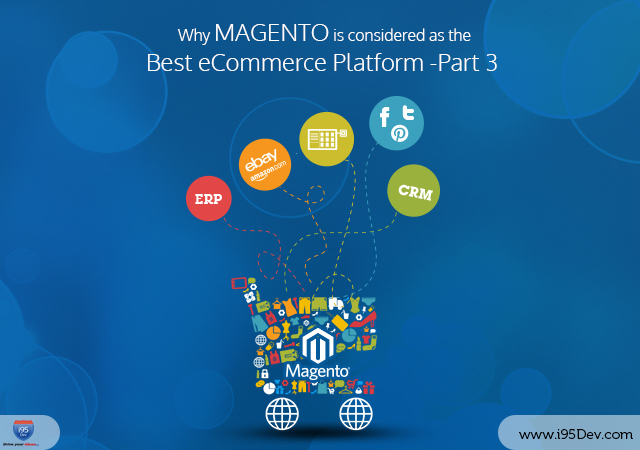 In this blog we will highlights how Magento can be integrated with Third party application to reap more benefits. Magento being a highly flexible and open source platform enables you to integrate with various third party applications like ERP, CRM, POS, etc. Having Magento connected to your ERP, CRM, and POS will lets you to keep track of inventory, sales and customers all within one system which in turn allows you to get more out of your existing investments. This is incredibly powerful because you will not have to go back and forth managing each piece of software individually or worrying about what information is missing from each application. Integrate Magento with Social Media Platforms like Face Book, Twitter, and Pinterest etc. Customers spend bulk of their time online on social networking sites. They use them to interact with friends, discover new trends and products, recommend new trends and products, etc. Retailers, who want to find, connect and retain customers, have to be present at all these locations. To help retailers, these social networking sites now have the added capability to allow customers to purchase products directly from the site. For any further information on our offerings please contact us at http://www.i95dev.com/contact/ or call us on 301.760.7499. We would be more than happy to understand your requirement and help you out with our expertise.